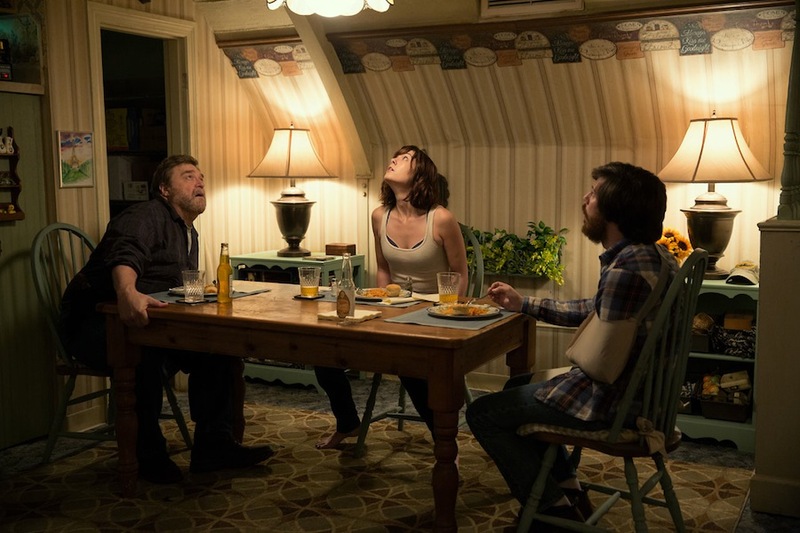 Not exactly a sequel, 10 Cloverfield Lane has been dubbed a “blood relative” of Cloverfield, the 2008 monster movie. It’s not necessary that you see the first before seeing the second, but understanding the basic plot of the original will set you up for success when it comes to this film. In a nutshell, Cloverfield is a horror film, a found footage flick, a monster movie, a tale of survival in a world gone crazy. Knowing that 10 Cloverfield Lane also takes place in that cinematic universe will prepare you for something other than just a thriller set in a bunker. So while the majority of the action takes place below ground & the majority of the plot centers on the three characters inhabiting this tiny home, the sci-fi element of the franchise remains in the background, and should remain in the back of your mind. Basically, don’t walk in expecting Panic Room or you’ll walk out disappointed. Having recently had a major fight with her fiance, Michelle drives away from New Orleans through the night in order to escape trouble she can’t face. But what she doesn’t know is that trouble of a different kind is awaiting her on the road. After getting into a shocking car accident, Michelle finds herself in the basement bunker of a conspiracy theorist named Howard. He tells her that the world above is gone, that an attack was carried out, whether by Martians or Russians no one knows, but the fact remains that not he, Michelle, or a young man named Emmett can step outside for at least a year or two, on account of toxic gas or nuclear fallout. Michelle, being relatively intelligent, understands that Howard is a psycho, but has absolutely no idea just how wacky the world has become while she was out cold, nor how she will survive with her sanity intact. There are many reason why this film is the best I’ve seen all year. One is its constant roller coaster of audience decisions. What I mean by that is exactly this; just when you think you know who to trust, the bottom drops out. And not in a cheap thrill-ride way, not in a twist that you never saw coming way, not in a complete reversal of character way, but with a clever up-and-down mentality that keeps audiences on their toes, lures us into thinking we can relax, shocks us into realizing that we can’t. It’s this unexpected & violent changing of moods that makes the movie so enjoyable, so vibrant, and so fun, even while you hide your eyes for fear of what might happen next. With only three characters and only 100 minutes, there’s a lot of very detailed work put into the story, the result of which is a layered fabric instead of a simple blanket of ideas. And speaking of detailed, another excellent addition to this film is the set itself. The bunker is amazing, well thought-out and well stocked with supplies, a place that’s both very homey and extremely creepy at the same time. I’d love to take a tour of this place, love for it to actually exist, though I think I’d like a lot of light & a bunch of friends along for the ride. Add in some very unique comedy, dark humor at its finest, & three incredible performances by the cast and you’ve got yourself a super-strong film, completely independent from the universe in which it takes places. Although, I still recommend remembering why we’re here to begin with, how this story might connect to others, and where it might go from here, because those ties are still solid; they haven’t gone away just because we’ve moved underground.